Two medical care organizations are launching campaigns with their new agency partners to coincide with the start of the flu season. One Medical's first new work in two years uses contextual advertising to raise awareness about its healthcare services. The "Sick Cities" creative, developed with Goodby Silverstein & Partners (GS&P), uses messaging to point out places where people might encounter germs. One bus ad, for instance, points out that there is a lot of gum on the ground before wondering what else could be out there as well. GS&P created more than 130 unique advertisements for places where getting sick or injured is common, including NYC's Times Square and LA’s Sunset Strip. The campaign will also extend online, where social and digital advertisements respond to people’s specific sickness- and injury-related searches. In addition to this campaign launch, One Medical is undergoing a brand overhaul to align with the company’s expansion to 72 offices in nine cities as well as to reflect its new service offerings in pediatrics and mental health. San Francisco design agency Moniker collaborated with both GS&P and the One Medical team to develop the photography for the campaign as part of this full rebranding makeover. Separately, CityMD's first effort under AOR Terri & Sandy uses humor to encourage germ-infested, coughing people to visit the walk-in clinic's services. This is also CityMD’s first fully integrated campaign. Prior creative campaign development was handled in-house. 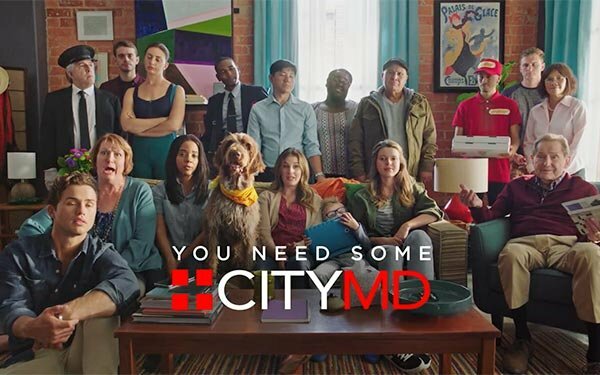 "You Need Some CityMD" features fictional sick individuals as their family and friends beg them to seek assistance. The first TV spots debut this week along with paid digital video. Consumers are invited to submit their own sick-person pleas via the brand’s Twitter account. Out-of-home campaigns via subways and the Long Island Rail Road, two highly germ-infested environments, will launch Dec. 1.